Thomas Dunne Books, 9780312607548, 352pp. The Bronx Is Burning "meets Chuck Klosterman in this wild pop-culture history of baseball's most colorful and controversial decade "
""The Major Leagues witnessed more dramatic stories and changes in the '70s than in any other era. The American popular culture and counterculture collided head-on with the national pastime, rocking the once-conservative sport to its very foundations. Outspoken players embraced free agency, openly advocated drug use, and even swapped wives. Controversial owners such as Charlie Finley, Bill Veeck, and Ted Turner introduced Astroturf, prime-time World Series, garish polyester uniforms, and outlandish promotions such as Disco Demolition Night. Hank Aaron and Lou Brock set new heights in power and speed while Reggie Jackson and Carlton Fisk emerged as October heroes and All-Star characters like Mark "The Bird" Fidrych became pop icons. For the millions of fans who grew up during this time, and especially those who cared just as much about Oscar Gamble's afro as they did about his average, this book serves up a delicious, Technicolor trip down memory lane. DAN EPSTEIN has written for "Rolling Stone," "MOJO," "Los Angeles Times," "USA Today," "Time Out," produced shows for VH-1, and is the author of "20th Century Pop Culture. "He lives in Southern California and is the Managing Editor of shockhound.com, the music website affiliated with the Hot Topic retail chain.A Q&A with Dan Epstein courtesy of Scratchbomb.com, May 2010As a kid, I was fascinated by 1970s baseball. The huge afros, the amazing facial hair, the retina-burning uniform designs--it seemed like such an insane, colorful era, particularly when compared to the heavily moussed 80s, where I spent most of my kid-dom. (Of course, there were some colorful characters then, too, but that's a tale for another time. )Whenever I had some disposable income (which was not often), I would spend it at a baseball card convention or store, usually on a large plastic box filled with completely worthless cards from 1977 or 1975, just so I could savor such sartorial majesties as Willie McCovey's sideburns. My elementary school library had these slim books on each major league team, all published in the mid-'70s, which I borrowed repeatedly. And whenever my grampa took me to Cooperstown, I'd seek out the unbelievable mini-exhibit on the technicolor uniforms from those years (sadly, no longer there).While there are some chronicles of players and teams from the 1970s ("T""he Machine" and "Ladies and Gentlemen, The Bronx Is Burning" are great, recent examples), there haven't been many (if any) retrospectives about the decade in total. When people speak of a Golden Age of Baseball, they usually save such mythologizing for the 1950s and its stainless, sepia-tone heroes. But now there is finally an evangelist for game as played in the Me Decade. 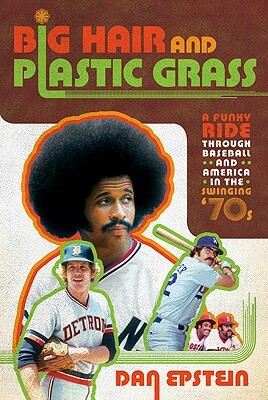 Journalist Dan Epstein has penned a love letter to 1970s baseball entitled "Big Hair and Plastic Grass: A Funky Ride through Baseball and America in the Swinging 70s." ESPN's Rob Neyer has said of this tome, "What the 1960s were to America, the 1970s were to baseball, and Dan Epstein has finally given us the swinging book the '70s deserve." The book drops May 25 from Thomas Dunne Books, and there will be a big ol' release party at the Bell House in Brooklyn on May 26 (I for one am excited to try the Oscar Gamble hot dog that will be served there).Dan was generous enough to take some time out of his busy schedule and answer some questions via email about Astroturf, day-glo erseys, the best Topps card designs, and the worst promotions of all time. Read all about it after the jump.What compelled you to write this book?About ten years ago, I went in search of a good book on '70s baseball; I was born in 1966, so this was the era when I first fell in love with the sport, and I wanted to relive some of those memories, and maybe gain a greater understanding of the period. At the time, the only thing out there that came even close to what I was looking for was Phil Pepe's "Talkin' Baseball: An Oral History of Baseball in the 1970s"; but while that's a highly enjoyable read (and one I would recommend to anyone interested in the era) I didn't feel like it showed as much appreciation for the funkiness and uniqueness of the era as much as I would have liked--nor have any other of the decade-spanning '70s baseball books that have been published since then. I don't come from a sportswriting background--music and pop culture has been my beat for the past two decades--but I felt that, as a baseball fan, a student of pop culture, and a child of the '70s, I could write a love letter to '70s baseball that also truly celebrated the weirdness of the period. I have a theory that some of the excesses of 1970s baseball--huge afros, crazy facial hair, drugs, wacky uniform designs, etc.--were the product of the sport desperately trying to catch up after being so resolutely square for so long. Your thoughts? See above.Who were your favorite team and player as a kid? Least favorite? In the '70s, I split a lot of time between Los Angeles and Ann Arbor, Michigan, so my two favorite teams were the Dodgers and the Tigers. My favorite Dodger was Ron Cey. I loved that he was known as "The Penguin," and that this oddly-proportioned guy with the funny walk could actually be an All-Star third baseman. I wore #10 on my Little League jersey in his honor. For the Tigers, I loved Willie Horton, Mark Fidrych, Ron LeFlore, etc., but my true favorite was Lou Whitaker. When Sweet Lou came up from the minors, I told all my friends he was going to be a star; and unlike my other grade school baseball predictions (like my brief championing of the Blue Jays' Doug Ault as a sure bet for superstardom), it actually panned out! Least favorite team? I hated the Reds, because they were so damn good and always gave the Dodgers a hard time--and I also hated them for sweeping the Yankees (who I liked at the time) in the '76 World Series. Least favorite player would have to be Fred "Chicken" Stanley, at least when he was on the Yankees; he was the weak link in that lineup, and a really mediocre shortstop, and I couldn't understand how he continued to have a job in the majors.With the disappearance of non-retractable domed stadiums from baseball, Astroturf is all but gone from the game. What players from the 70s would suffer the most if they had to play in this new carpet-free world? The players who benefitted the most from artificial turf were the guys who didn't have a lot of power but could make contact with the ball and run like hell, and infielders (especially shortstops) who had good range but not so great arms. Dave Concepcion, Larry Bowa and Freddie Patek all fit the above profiles, and all figured out how to get extra mileage on a throw to first by one-hopping it off the turf. They were all key members of their teams, to be sure; but they also all would've had a tougher go of it playing full-time on real grass.Worst promotion: Cleveland's Nickel Beer Night or Chicago's Disco Demolition Night? 1972, no question. I would describe the design template for that year as psychedelic Hollywood retro; it's as if each player was briefly transported into the "Lucy in the Sky with Diamonds" sequence from "Yellow Submarine." And it made even the scrubs look like superstars.What are the features you look for in an awesome 1970s baseball card, in terms of design, pose, facial hair, etc.? Simply depends on the card. It's hard to beat funky facial hair or a voluminous 'fro, and action shots can be really cool, too. Then again, would a card of Roberto Clemente or Hank Aaron be any more awesome if they'd sported Fu Manchu moustaches? I don't think so.Dock Ellis's no-hitter-on-acid has gotten a lot of renewed interest, thanks to the No Mas animated short that came out last year. How prevalent was recreational drug use in baseball in the 70s? What was the drug of choice among players? And had performance enhancing drugs entered the picture yet? I don't have anything other than anecdotal evidence to go on, but pot use seems to have been fairly prevalent among major leaguers in the '70s. Coke much less so, though (like in the rest of America), it became more common by the end of the decade. As far as performance-enhancing drugs, it's not inconceivable that steroids had entered the picture by then--they've been around since the '30s, and there's evidence that football players were using them as early as the late '60s--but they were hardly widespread. Back in those days, weight training and getting buff wasn't a regular part of the major league baseball fitness regimen; the prevailing wisdom of the time was that you should run a lot, and that lifting weights would make you too "muscle-bound" to be effective in the field. Use of amphetamines, however, was extremely common; I'm sure a lot of players wouldn't have made it through a 162-game season without them--though whether or not "greenie" use actually improved anyone's play or jacked up anyone's numbers in the long run is still pretty debatable.Is there a game or playoff series from the 1970s that you consider a "lost classic"--something that should still be remembered now but isn't?Well, it's not been completely forgotten, but the June 28, 1976 game between the Yankees and Tigers is pretty dear to my heart. That was the night that Mark "The Bird" Fidrych made his national TV debut, beating the Yankees 5-1 on Monday Night Baseball in front of an ecstatic Tiger Stadium crowd. He's so goofy on the mound, yet also so dominant--and during the post-game interview, he's just radiating pure joy. "The Bird" was the real deal, both as a pitcher and as a human being, and clips from this game always bring that home beautifully.What event marked the death knell of 1970s-style baseball (other than the arrival of the year 1980)? Just like the increasing freakiness of the '70s, it's hard to ascribe the demise of 70s-style ball to one particular event, though it's not too much of a stretch to say that, as America became increasingly conservative during the Reagan years, the game did so as well. I do think that 1980 was the last truly "70s" year of baseball--after being denied for half a decade, the Phillies and Royals finally made it to the World Series, and played the first all-Astroturf fall classic. Then came the players strike of 1981, followed by the "Pittsburgh Drug Trials" of 1985, owner collusion in the late '80s, and (as we know now) the spread of steroids. Baseball definitely changed in the '80s, and for the worse.Are there any modern players you can imagine playing--and thriving--in the 1970s?I'd say the most "70s" player out there today is Tim Lincecum -- not just because he has long hair and got popped for weed, but also because of his natural charisma, his unusually slight build (at least for a 21st century starting pitcher) and unorthodox delivery and mechanics. And if he can do this well against bulked-up batters in the PED era, just imagine how well he would have done in the '70s.